It was a great game, so who cares about their sexuality? I SEE that Liberal Democrats Senator David Leyonhjelm is in hot water over a debate he was having in parliament about women's safety when he told Greens Senator Sarah Hanson-Young to stop shagging men. At almost the same time, television dinosaur Bert Newton made stupid comments about the casting couch back in his day while on stage at the Logies to present an award. Both these peanuts have basically admitted that this is the way they roll, in particular the senator who refuses to apologise because he is representing Australians and this is normal Australian behaviour. And you know what? I have to agree with him - it does seem to be normal Australian behaviour. Which means we are a bunch of bogans. How sad is that? 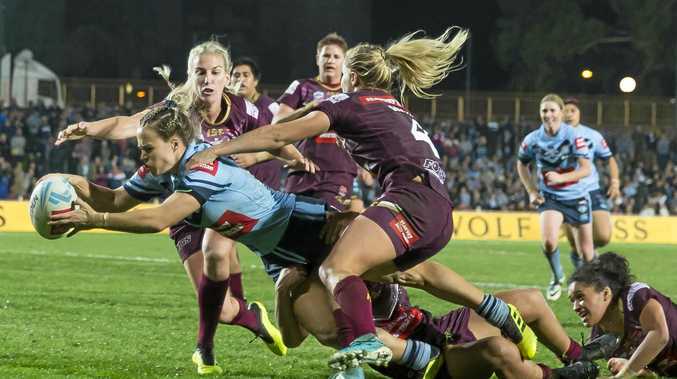 I was in a conversation the other day, or witnessed it at least, where the discussion focused on the Qld v NSW woman's rugby league State of Origin match. Now, I wrote about what a good game it was the other week so I was interested to hear other men's opinions but all I heard was speculation on how many of the girls were gay followed by snickering. Surely in 2018 we are better than this. Surely they should have been talking about what a good game it was, how skilful the girls were and how tough the match was, not what their sexual preferences were. If you told me my favourite NRL player was gay, would it make any difference to me? If you told me my favourite AFL player or golfer or swimmer was bi-sexual, would it make any difference apart from the fact they would have twice as many people waving to them? Transgender soccer players or basketballers - does it change the way I think about their sporting ability or their character? Hopefully you get the idea that as far as I am concerned the answer is "no, I don't care about their sexuality". Of course, that is just me. If you have a certain belief that's fine - don't watch them and don't support them but please don't criticise them for their own personal persuasions. I was brought up to respect woman and protect them, if need be, and that's the way I still feel today. Of course some don't want my protection and that's fine. For a politician to say what that senator said the other day during a debate about woman's safety is nothing short of appalling and for him to think his behaviour is fine as it represents Australians is a worry for all of us. As for David and Bert, there is probably no changing them. It's just a pity we are paying Dave. I suppose it's whatever turns them on - I just get to turn them off.